Anzaldua’s drawings come from transparency drawings, notes and diagrams she had presented in the mid 1990s in workshops and lecture “gigs” throughout the USA. The artists –PoC, indigenous, Black, queer and trans– draw inspiration from several of Anzaldúa’s known theoretical reflection such as borderlands, Auto-historia, making faces/ haciendo caras, Coyolxauhqui Imperative, Coatlicue State, or indigenous mythologies. All the displayed works by Gloria Anzaldua are part of “Between Word and Image. 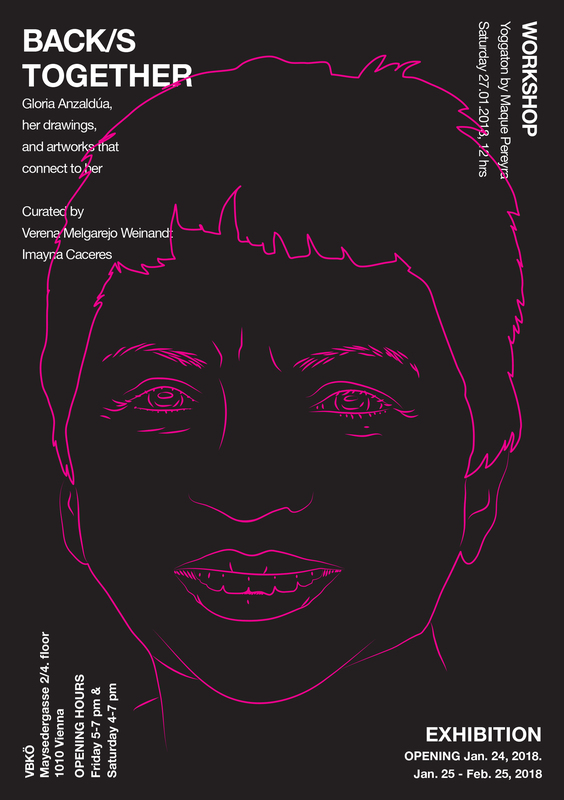 A Gloria Anzaldúa Thought Gallery” curated by Julianne Gilland from the Benson Latin American Foundation in Texas. Back/s Together is the second part of the ongoing project “Armando Vo(i)ces” from Verena Melgarejo Weinandt. Nadia Bekkers, Imayna Caceres, Lía García, INVASORIX, Marissa Lôbo, Verena Melgarejo Weinandt, Rurru Mipanochia, Maque Pereyra, Naomi Rincón Gallardo, Fannie Sosa, Sophie Utikal, Yos Piña Narvaez.